We traveled very long distances to reach ports of call on this cruise. 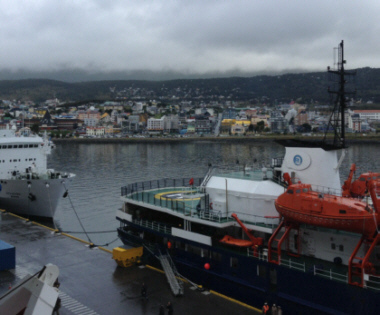 We left Buenos Aires on Sunday but did not arrive at Ushuaia, our first port, until Thursday morning. 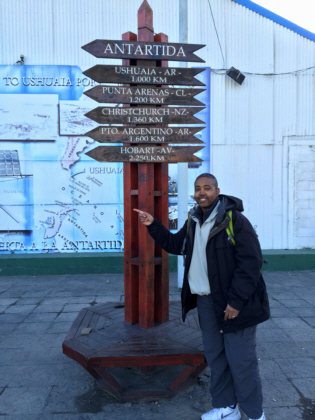 Ushuaia is known as the world's southernmost city. 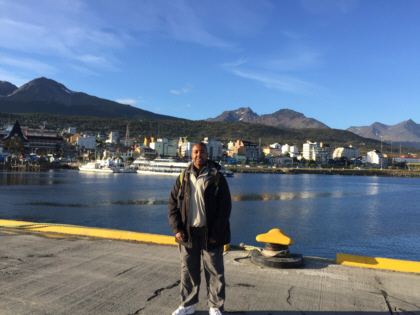 It is located on the Isla Grande (Grand Island) of the Tierra del Fuego archipelago at the bottom of South America and is a popular stop for those who are heading to Antarctica. Edged by water and surrounded by mountains, Ushuaia is a photogenic port city. 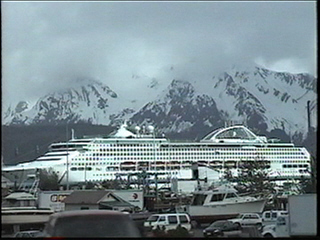 In port with us that day were Antarctica expedition ships and cargo ships. It was a chilly overcast morning with a light rain. 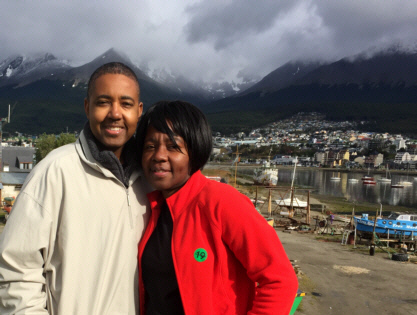 Traci and I were booked on the Ushuaia In Depth shore excursion. This motorcoach tour began with a ride through the streets of the city. I only saw one traffic light during our visit. I do not even remember seeing stop signs. It seems whoever gets to an intersection first has the right-of-way. There was nothing that really wowed me about the appearance of the city as we rode through. I was more fascinated to know I was at the bottom of South America. 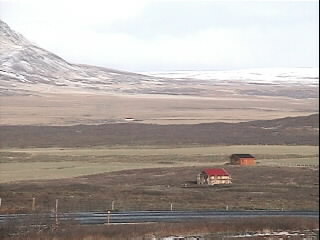 I was surprised to learn that nearly 60,000 people live in this isolated region. The draw is the electronics industry, the naval base, and the tourism industry. 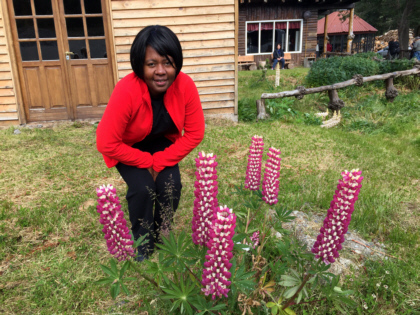 From the late 1800's to the mid-1900's, Ushuaia was home to prisoners. 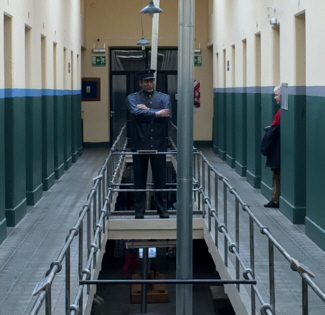 We were given about an hour to visit the former prison which is now a part of a multi-winged museum. In addition to the prison wing, there is a maritime wing, an art gallery, a history wing, and an Antarctica wing. 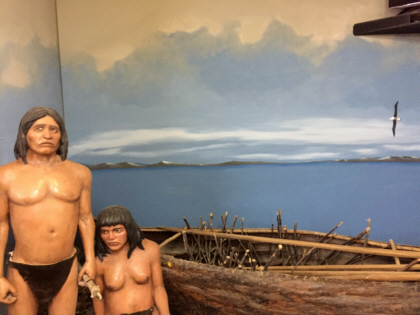 What fascinated me the most about the maritime section was learning that the native Yamana Indians who fished the area were usually naked. 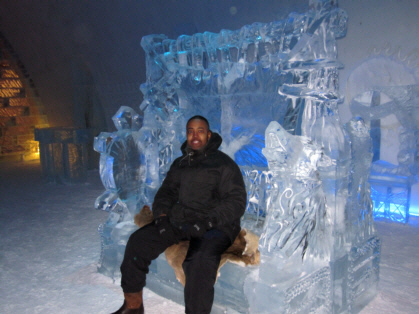 Ushuaia is a cold place. I don't know how the Yamana were able to survive here without wearing clothes. 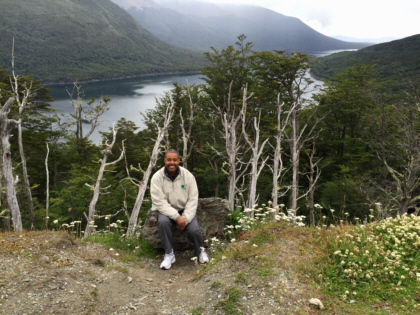 From the museum, we were driven outside the city to enjoy the scenic valleys of the Tierra del Fuego. The rivers, meadows, and cloud-covered mountain peaks made this an incredibly scenic ride. There is some concern these days. The region has a beaver problem. The beavers are destroying the trees to build their dams. We traveled as far as Garibaldi Pass in Patagonia. It is a paved road that traverses the Andes Mountains. The highlight for me of our time outside the city was our lunch stop that was included in the tour. 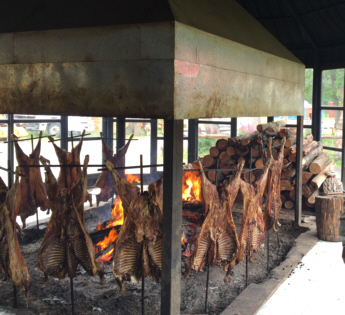 We were served Patagonia lamb that had been cooking over an open fire for at least 4 hours. 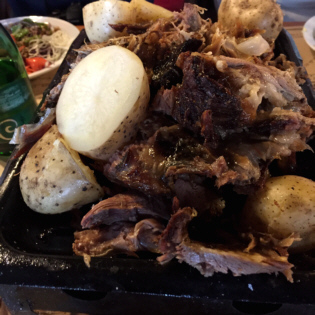 The lamb and potatoes were brought to our table still sizzling and crackling. It hit the spot. Traci doesn't eat lamb. This was not a problem. The servers brought her some delicious fresh trout. Free beverages (alcoholic and non-alcoholic) were available. 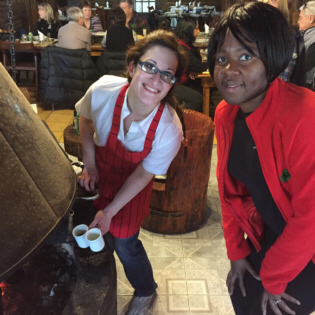 We were also given the opportunity to taste a sweet cinnamony coffee. I am not a coffee drinker but I took a sip. lamb and potatoes - Yum! At the conclusion of the lunch, we had time to walk around the grounds. There was an enclosure where dogsled dogs are kept. We looked at them from outside the fence. Otherwise, there was a fee to go inside the fence. There was also a souvenir shop. I had an interesting experience there. Our group consisted of mainly English speakers with a few Spanish speakers sprinkled in. When I entered the souvenir shop which was full of people from our tour group, the shop owner greeted me in French. Huh? She proceeded to ask me in French if I speak French or English. I replied, "Both", and she continued in French to welcome me and to tell me that she is available to answer any questions I might have. I was not expecting to speak French on this trip but I am always appreciative for an opportunity to practice. Our 6.5-hour shore excursion concluded back at the port section of Ushuaia but not before another visit to the museum so that Traci could retrieve her wallet that she accidently left in the souvenir shop. Whew! Back in town, the sun came out and warmed us to the point we no longer needed our light jackets. Traci and I took a picture at the iconic "Fin del Mondo" (End of the World) sign and then entered the nearby tourist information center. 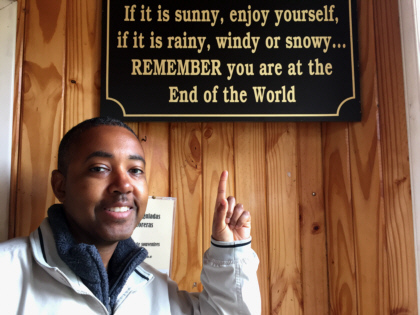 I stood in line to get our stamped certificates that says we have visited the 'end of the world'. Afterwards, we took advantage of the real reason I suspect most people were there - free Wi-Fi. The connection was slow but I was able to check my email and Facebook (somewhat). Traci, on the other hand, was having issues. She was in the process of searching for a new job at the time. She had received emails replies from several companies but the Wi-Fi connection was so slow that she was not able to load all of her email content. We ended up leaving the tourist center and finding an internet cafe on the main street. It cost the equivalent of $3 USD for an hour. Traci was finally able to read her emails. Good news - one of the emails eventually led to interviews when we returned to the U.S. and a job offer! 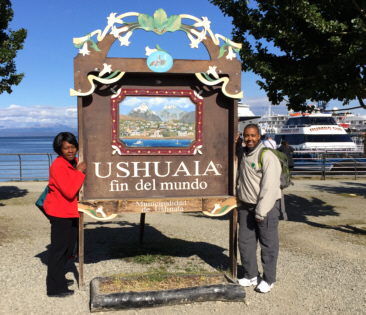 Traci and I walked the length of the commercial section of Ushuaia's main street which contains stores, restaurants, hotels, souvenir shops, and even a casino. 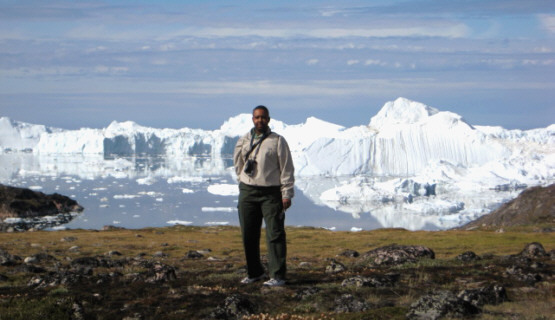 There were also several travel agencies advertising relatively inexpensive trips to Antarctica. As we walked the street, we did not encounter many English speakers; therefore, we had to rely on Traci's long-forgotten high school Spanish and charades the few times we decided to ask for the location of various establishments. 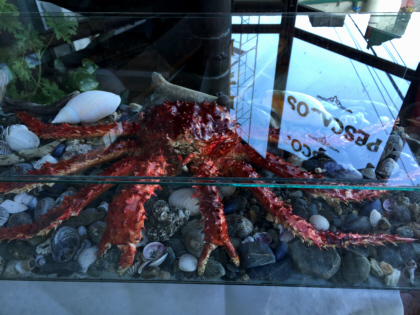 It was interesting to see the restaurants along the street because a popular dish is the gigantic red king crab. Several restaurants had one of these behemoth crustaceans in a tank. I am not a crab-eater but Traci is and she was curious about trying one. However, she was not hungry enough to justify a sit-down meal. Therefore, she did not taste one of the crabs. Near the end of our stroll, the sun sank down behind the surrounding mountains. Boy, did the temperature drop! I could see my breath. I was happy I had my winter jacket and gloves in my backpack. They came in handy. I still cannot get over the fact that the Yamana Indians lived here without wearing clothes.